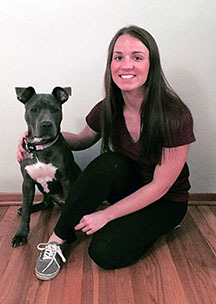 Nicole Veile has always had a passion for canine behavior, so she obtained a degree in Biology. Since then she has read books, worked at animal shelters, volunteered for rescue organizations, fostered dogs and completed internships at zoos, all to help her grasp a hands-on experience. She is now a passionate advocate for clicker training and seeks ongoing educational opportunities and experience through positive reinforcement methods. Nicole leads our group classes and guides new puppy owners to behavioral success through New Puppy Consultations.